Based in Surat Thani, Lomprayah High Speed Ferries Co Ltd was first established in 1996 before officially registered as a company later in November 1999. They have been serving great transportations for sea and land to numerous beach goers in Thailand over the years. Lomprayah High Speed Ferries provide amazing ferry routes that go from Koh Samui to Koh Pha Ngan, Koh Tao and Chumphon. 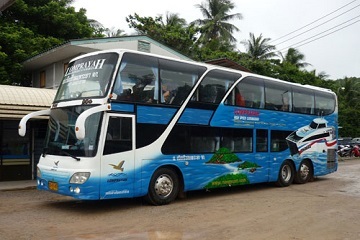 This Thailand company also has connecting bus services that travel from Chumphon to the city of Bangkok or Rambuttri in Khao San to Chumphon easily. You can actually book your bus tickets online through Easybook's hassle-free website and mobile app conveniently now. The buses that operate under Lomprayah High Speed Ferries are available in double decks and they come with comfortable seats for you to have an enjoyable ride before new memories are being created upon arriving at the destination. Air-conditioning systems are also installed on the buses to allow travellers to have a cooling and refreshing journey before stepping out into the warm weather of Thailand. If you are looking to head to the sandy beaches, you should definitely consider their fleet of high-speed catamaran ferries are one of the most demanded services available in Thailand. Trust the company that gives great services to provide the best vehicles that is both stylish and speedy for your travelling needs. Having faster boats to operate Lomprayah High Speed Ferries means they run from their own ports to make your journey with this company an even special one. This company offers 7 different kinds of Lomprayah ferry that are available, which are named Pralarn, Namuang, Maenam, Koh Prab, Thongsala, Maehaad and Thapdaorai. You can find Lomprayah High Speed Ferries providing transfer services within Bangkok, Hua Hin, Chumphon, Koh Tao, Koh Pha Ngan, Koh Samui, Surat Thani, Nakhon Si Thammarat, Krabi and Phuket with the high-speed catamaran. Besides all the above, Lomprayah High Speed Ferries can also help you to book flight tickets, make bus reservations, arrange tour trips and many others. They are really capitalizing on their business to serve you the best to their ability whether it is by bus or ferry. Purchase your bus ticket for Lomprayah ferry now through Easybook's website right here. Alternatively, you can also download our app to your mobile devices, so you can book your bus tickets any time, any place. Use the hashtag #Easybook in your social media posts after you have arrived at your destination with Lomprayah High Speed Ferries! Lomprayah High Speed Ferries Co., Ltd. 154 Rambuttri rd. Banglumpoo, Thailand.